At Cedar Dental Centre in Kamloops, our dentists are always happy to accept new patients. Read on to find out what to expect during your first visit to our dental clinic. 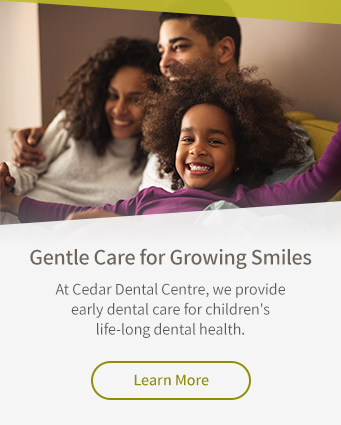 The Cedar Dental Centre team welcomes you to our dental clinic. We know that choosing a new dentist is a big decision for you and your family, and we want you to know that we'll be here for you each step of the way. We want you to feel at ease from the moment you enter our dental office. Read the frequently asked questions below to learn what to expect during your first visit with us. When you visit our office for the first time, please arrive about 10 minutes early for your appointment so that you have time to fill out the requisite New Patient and Dental Health History forms. You wait for your appointment to begin in our comfortable waiting room, where you'll find ample reading materials and soft, roomy chairs. At the outset of your appointment, your dentist will discuss your oral health needs with you in reference to your Health History form. During and after your appointment, your dentist or hygienist will be glad to answer any questions you may have about your dental health and treatment options. You can book your next appointment at our office, or you call us any time during business hours. If you are experiencing a dental emergency, please call us immediately and we'll make room in our schedule to see you right away. We accept cancellations over the phone, in person or via email, and we can reschedule appointments over the phone or in person. If you need to cancel or reschedule an appointment, please call us 2 days in advance to let us know. In the days leading up to your appointment, you will receive automated appointment reminders by either phone or email, for your convenience. If you need to cancel or reschedule an appointment, please call us 2 days in advance to let us know. Does Cedar Dental Centre offer direct insurance billing? Cedar Dental Centre accept most insurance plans. Bring your insurance information with you to your first appointment, and our admin team will be happy to submit your claim to your insurance company directly.